Trust food-hunting with friends on a Friday evening to bring you to unexpected places. Thus, notwithstanding the heavy traffic in C5 and Kapitolyo, our search for decent dinner brought us to the latest talk of the town that is Locavore. 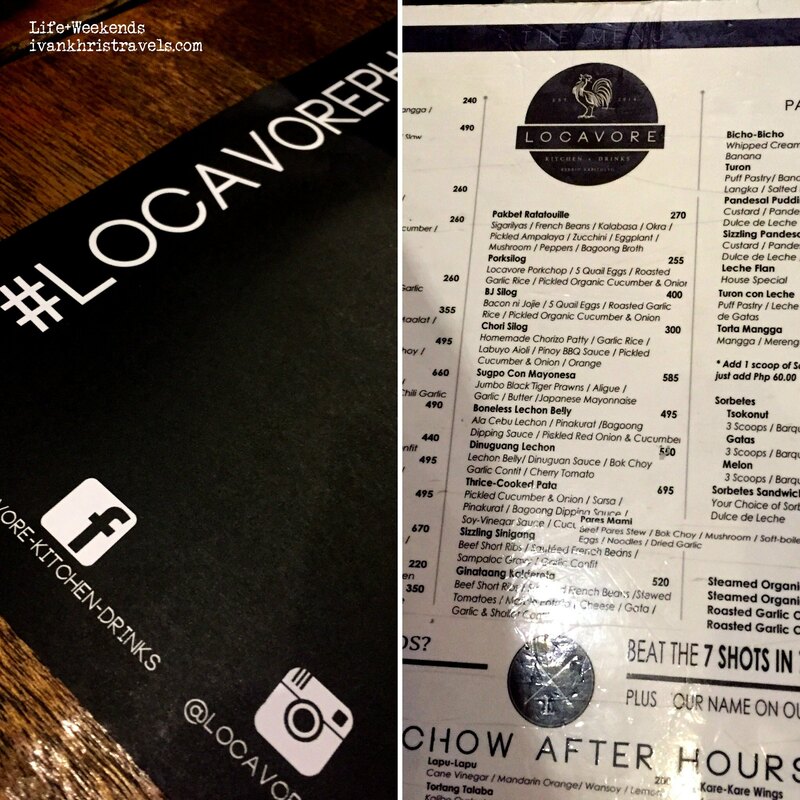 I neither had any idea of what Locavore specializes in nor with what its name meant but I was told that they serve good Filipino food with a twist. I have previously been to so many restaurants claiming to put a spin on Pinoy food and they all fell short of my expectation. So for Locavore, I was not particularly expecting much. When we were finally able to wiggle our way out of the knotted traffic in Kapitolyo, Pasig, we were greeted by a small restaurant, with an almost bare facade, save for the simple signage announcing that we have finally arrived at our destination. It looked like a bar, not unlike the ones you encounter in Timog. There were many diners that evening, so I started to lose my doubts about this place. We had to wait a little before we finally got our seats outside but it didn't matter because we were famished. [A server approached us and the nameplate displayed a celebrity's name. My eye caught another familiar name and I suddenly realized that the servers were all using the names of famous celebrities. We ordered the street food platter as appetizers. 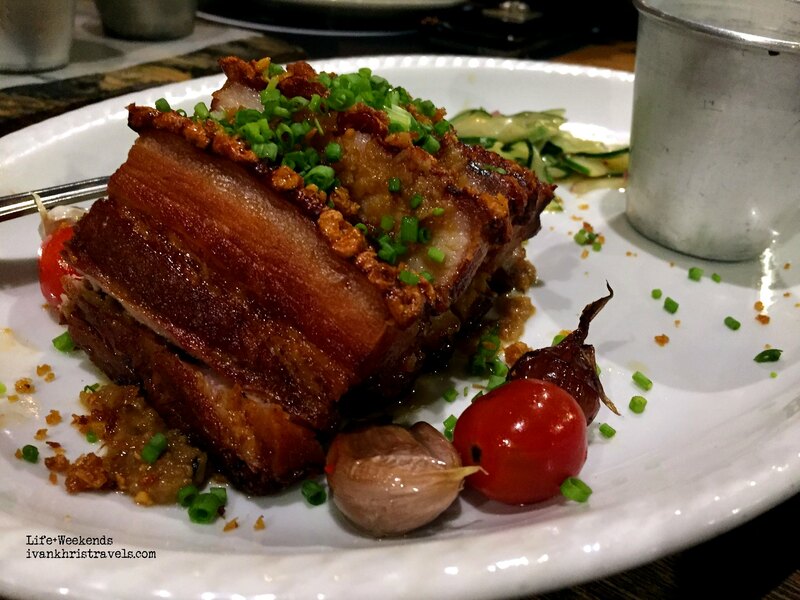 We also got the menu's must-tries; the Sizzling Sinigang and Boneless Pork Belly. We also ordered Pandesal Pudding for dessert and a pitcher of House Blend Iced Tea for drinks. 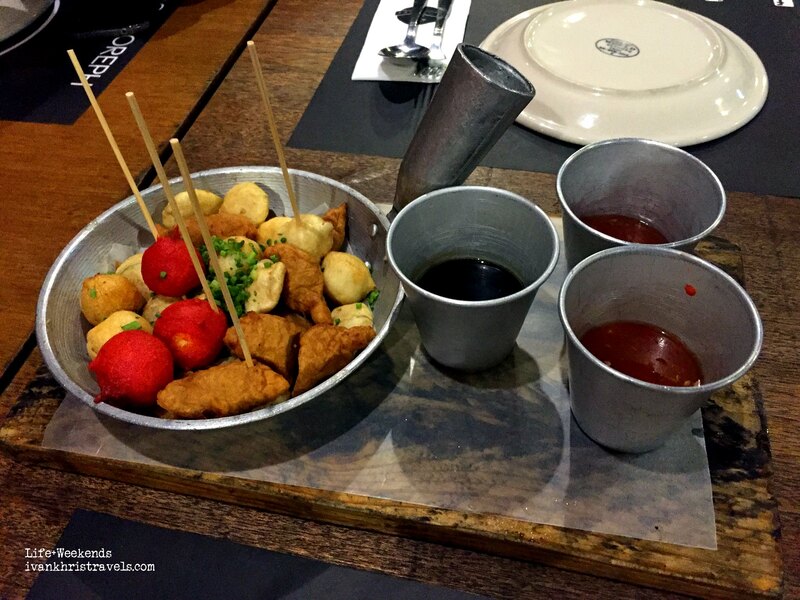 The street food platter is a sampler of fish balls, squid balls, kikiam and kwek kwek. It came with three dipping sauces -- classic sweet sauce, spicy vinegar and sweet chili sauce. It's a great introduction to the mains that were to come next or for pairing with a bottle of beer perhaps. 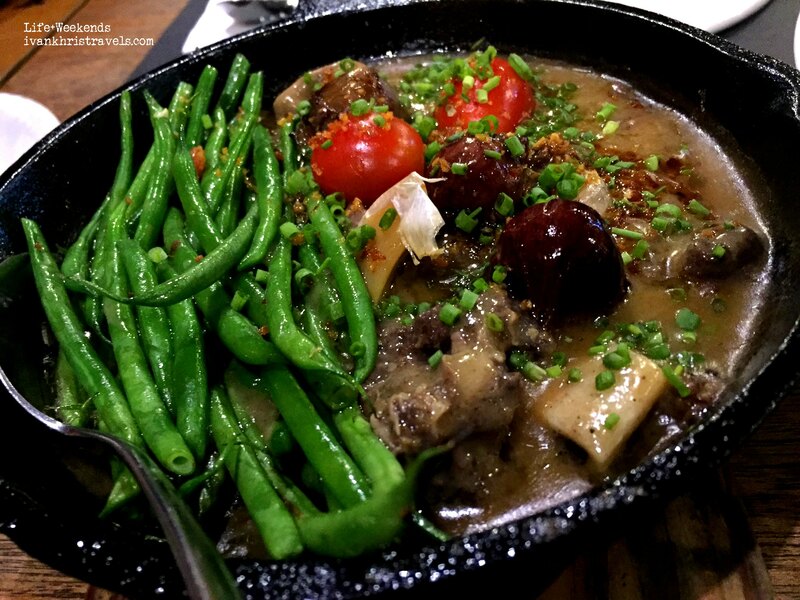 The Sizzling Sinigang is probably their best, most unique and most memorable dish. It’s a skillet of tender, fall-of-the-bone beef; French beans, cherry tomatoes, onions and garlic, swimming in rich, tangy gravy. Aesthetically, it looked more like roast beef than sinigang though. The Boneless Lechon Belly, meanwhile, is very reminiscent of Cebu Lechon. The skin was superbly crunchy and holds the seasonings and spices really well. It was very flavorful and, as they say, deadly sinful. This dish, as well as the Sizzling Sinigang, deserves heaps of steaming white rice. With all the savory dishes that we've had, it is but fitting to end our meal with a good dessert. The Sizzling Pandesal Pudding is served warm and almost gooey, topped with scoops of butter vanilla ice cream (mantecado) and drizzled with salted caramel sauce (their menu said it was salted egg dulce de leche). The combination of warm and cold, and soft and sweet was the perfect closing to an excellent meal. 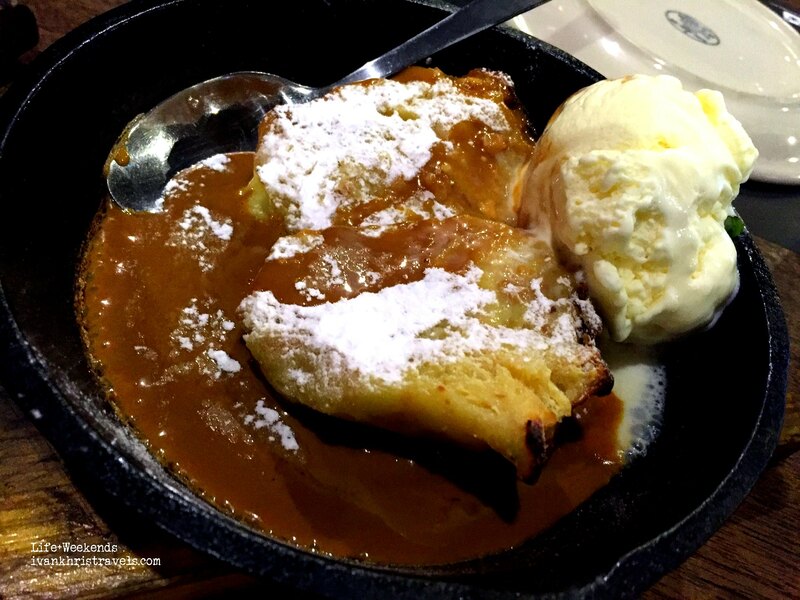 Also, where else would you find a dessert that is served sizzling? The long drive to this restaurant was worth it. It had good ambiance, the food did not disappoint and the price was just right. I would definitely say that Locavore delivered well in putting the twist in classic Pinoy favorites.